In this study, one dimensional and two dimensional ground penetrating radar modeling using the Matlab programming language with finite difference method has been studied. The purpose of the study is to investigate the effects of possible structures and geological structures on one dimensional and two dimensional radargrams. A perfectly matched layer (PML) was used to prevent reflections at the model boundaries and to increase discrimination power in radargrams. The Ricker wavelet was used as a source wave. In addition, one dimensional and two dimensional radargrams prepared for the same medium were compared with each other. The effects of underground models prepared for different medium on one dimensional and two dimensional radargrams were revealed. Bu çalışmada sonlu farklar yöntemi ile Matlab programlama dili kullanılarak bir boyutlu ve iki boyutlu yer radarı modellemesi yapılmıştır. Çalışmanın amacı yer altında bulunması muhtemel yapıların ve jeolojik yapıların bir boyutlu ve iki boyutlu radargramlar üzerindeki etkisi incelemektir. Model sınırlarında oluşan yansımaları önlemek ve radargramlarda ayrım gücünü artırmak amacıyla mükemmel uyumlu plaka (PML) kullanılmıştır. Kaynak dalgacığı olarak Ricker dalgacığı kullanılmıştır. Ayrıca aynı ortamlar için hazırlanan bir boyutlu ve iki boyutlu radargramlar birbirleri ile kıyaslanmıştır. Farklı ortamlar için hazırlanan yer altı modellerinin bir boyutlu ve iki boyutlu radargramlar üzerine etkileri ortaya konmuştur. Annan, A.P., Chua, L.T., 1992. Ground penetrating radar. Geological Survey of Canada (Edited by J.A. Pilon), Ottawa. Balanis, C.A., 1989. Advanced Engineering Electromagnetics. John Willey&Sons, Toronto. Berenger, J.P., 1994. A perfectly matched layer for the absorption of electromagnetic waves. Journal of Computational Physics 114, 185–200. Bergmann, T., Robertsson, J.O.A., Holliger, K., 1996. Numerical properties of staggered finite-difference solutions of Maxwell’s equations for ground-penetrating radar modeling. Geophysical Research Letters 23, 45–48. Cassidy, N., 2007. A review of practical numerical modelling methods for the advanced interpretation of ground-penetrating radar in near-surface environments. Near Surface Geophysics, 5, 5-21. Elsherbeni A.Z., Demir V., 2009. Finite Difference Time Domain Method for Electromagnetics with MATLAB Simulations. Scitech Publishing, Danvers. Georgakopoulos, S.V., Birtcher, C.R., Balanis, C.A., Renaut, R.A., 2002. Higher order finite-difference schemes for electromagnetic radiation, scattering, and penetration, Part 1: theory. IEEE Antennas and Propagation Magazine 44, 134- 142. Goodman, D., 1994. Ground-penetrating radar simulation in engineering and archeology. Geophysics 59, 224–232. Irving J.D., Knight, R., 2005. Numerical modeling of ground-penetrating radar in 2-D using MATLAB. Computers & Geosciences, 32, 1247-1258. Kaplanvural İ., 2011. Yer Radarı Verilerinin Modellenmesi ve Yorumlanması. Yüksek Lisans Tezi, Kocaeli Üniversitesi, Kocaeli (yayımlanmamış). Kurtulmuş, T,Ö,. Drahor M.G,. 2008. Yer radarı modellemesinde fiziksel ve geometrik parametre etkilerinin araştırılması. 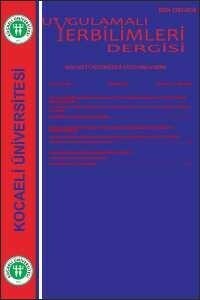 Hacettepe Üniversitesi Yerbilimleri Uygulama ve Araştırma Merkezi Dergisi, 29 (2), 37-52. Mancilla O.L., Trevino E.G., 1996. Synthetic radargrams from electrical conductivity and magnetic permeability variations. Journal of Applied Geophysics, 34, 283-290. Powers, M.H., Olhoeft, G.R., 1994. Modeling dispersive groundpenetrating radar data. Proceedings of the 5th International Conference on Ground-Penetrating Radar, Waterloo, Ontario, pp. 173–183. Sadiku M.N.O., 2001 Numerical Techniques in Electromagnetics, CRC Press, Florida. van der Kruk, J., Slob, E.C., and Fokkema, J.T., 1999. Background of groundpenetrating radar measurements. Geologie en Mijnbouw, 77, 177-188. Yee K.S., 1966. Numerical solution of initial boundary problems involving Maxwell’s equations in isotropic media. IEEE Trans. Ant. Prop., 14(3), 302 - 307.